Visión Latino Theatre Company, Latinos with a Vision, brings awareness to Latinos past, present, and future through storytelling. Visión Latino Theatre Company's supporters believe in the Vision of VLTC. If you would like to part of our growing family please consider supporting the vision. Visión Latino is a Not-for-profit 501(C)3 Organization, which means all donations are tax deductible (Donate Today). 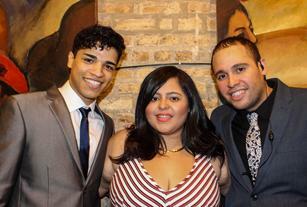 Visión Latino Theatre Company, Latinos with a Vision, located in Chicago, IL, was founded in August of 2014 by Xavier Custodio, Yajaira Custodio, and Johnathan Nieves. The theatre company was created when the Co-Founders were working on a production called "In The Heights" and they saw there was a need for Latino Artists to be able to celebrate their culture and share the struggles and perseverance of latinos. In September of 2015 Visión Latino had their Inaugural Show & Midwest Premiere with the play "Yellow Eyes" by Migdalia Cruz. On April 22, 2016 Visión Latino Theatre Company became a 501(c)3 Not for Profit Organization.